Double Top Pattern - technical analysis charts explained! A Double Top Pattern (DT) is a bearish stock chart technical analysis charts reversal pattern that is found at market tops. A Double Top is one of the most reliable stock chart patterns found in technical analysis charts. It is a straight forward pattern defined by two clear peaks in the market at about the same price levels. A triple top is a variation of this. The first peak is created when the prices fall back in a consolidation following a clear trending phase in the market. Prices then rise again to a around the level of the first peak but buyers fail to gain enough momentum to push prices up through the resistance. Prices can fall slightly short or slightly exceed the previous high but as long as it tops at around the same price level it is quite normal. Either way, it should be on lower volume. As prices fall back again sellers gain control and volume increases. The Double Top is created when prices break down through the level of the previous consolidation low and this should be broken on high volume. A normal market will usually come back up to back test the validity of the break down through support. This should be on much lower volume but on rare occasions, it may not do a backtest if the market is very weak. 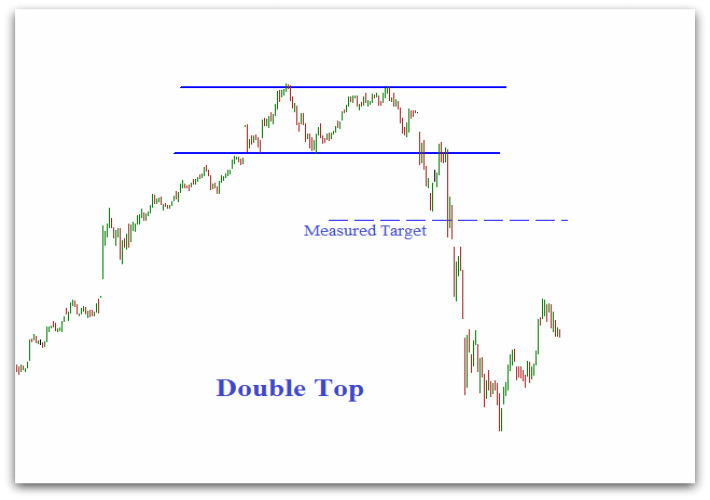 A valid double top pattern produces a measured move so we can find a price target by calculating the vertical height of the consolidation zone, and then measuring an equal distance below. An DT fails and is not valid if prices break back above the highs before hitting its price target. If prices are accepted back into the topping zone once it has broken down through support, it severely weakens the odds that it is a valid double top chart pattern.